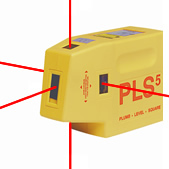 The PLS-5 self leveling point-to-point alignment laser tool is designed by contractors, for contractors. 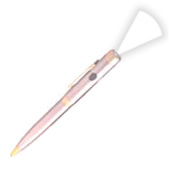 Self-leveling means no time wasted with bubble vials or constant level status checks. Turn it on and go to work. Lay out reference points faster than traditional, labor intensive methods. 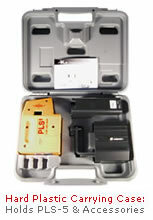 With an accuracy of 1/8" at 100 feet, the PLS-5 provides precise plumb, level and square references. No more 3·4·5 or swinging plumb bobs. Advanced dampening limits jobsite vibrations. The PLS-5 is compact, lightweight, durable, and water resistant. Take clear, stable reference points indoors and outdoors. The PLS-5 pays for itself on the first job! 5 Laser Beams: Forward, Up, Down, Left and Right. Range: +/- 100 feet (+/- 30.5m). LED Indicator: On/Off, Tilt, Battery Low. Accuracy (All Beams): <1/8" at 100 feet, <3mm at 30m. Weather Resistant: Splash & Dust Proof (IP54; IEC529). Cantilever Design: Allows for easy sight of opposing reference points. Advanced Dampening: Limits vibrations for stable reference points. Pendulum Layout Target: Helps with time-saving alignment tasks. 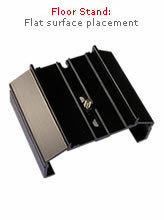 Floor Stand: Included floor stand allows for placement on flat surfaces. Magnetic Wall Bracket: Includes magnetic wall mounting bracket. Compact Carrying Case: Holds all accessories and fits under pickup truck seat. Battery Life: +30 hours continuous use.